Shaun Derry says he has always maintained the faith his Notts County side could avoid League One relegation. The Magpies have propped up the table this season and were favourites to go down when he took charge in November. But five wins from their last seven have lifted the club to a point from safety. "I think many people here have given up many times, perhaps even people here behind the scenes, but I didn't," the 36-year-old told BBC Radio Nottingham. "I always believed and always thought this is a crazy game we are involved in, especially at this stage of the season. Notts County have won each of their last four matches at Meadow Lane as they seek League One safety. "You get down to the last seven or eight games and the fixtures bring out some crazy results. That's what happened and we're back in the mix." Notts are searching for their fifth straight home win when they host play-off chasing Swindon at Meadow Lane on Saturday. Derry remains unsure exactly how many points his side will need from their last two games, with a trip to 16th-placed Oldham finishing the campaign. The Magpies secured a vital 1-0 win over Crawley last time thanks to Jimmy Spencer's headed winner. Derry, who is in his first managerial job, said: "The permutations are there and the players have been looking at them, definitely. At the minute, we are in good form and with the backing of the fans, who have been remarkable since we came in during November, we are in a good place. "I'm optimistic. If we can approach the game in the same manner than we have done in the last six or seven then we are going to give ourselves a good chance. "There's some six pointers that are going to play a part in where people finish. "It's the home form that has got us in this position and this is the place that will decide where we're going to be." 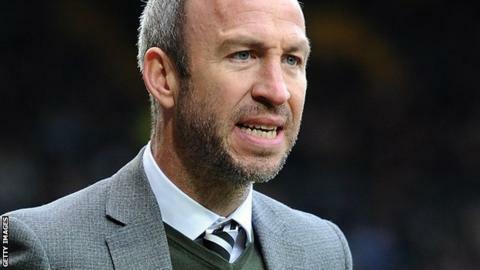 Read more on Notts manager Shaun Derry on 1-0 win against Crawley.